What is decarboxylation and why is it needed to enjoy your favourite topicals and edibles? Here’s everything you need to know about the most important step. Love edibles? Topicals? Feel like experimenting at home? Been cruising Pinterest and feeling confident? But if you haven’t heard the word ‘decarboxylation’, you’re about to make cookies that taste like weed, and not weed cookies. And I promise you, this is totally regrettable. You want to eat weed with purpose, not for pleasure. So how do you make ‘special’ cookies and what exactly is decarboxylation? It’s exactly that. De-carboxylating. To remove a carboxyl group from an organic compound. Gear it back to the raw, flowering cannabis plant (the organic compound). It is full of fresh cannabinoids in their most basic, acid form or with a naturally occurring carboxyl group. For example, THC is found in its raw form as THCA (the most abundantly present in a raw plant) and CBD is found as CBDA. Add that acid group and BAM. Not really ‘bam’ per se, because in its acid form, cannabinoids are non-psychoactive and only carry whole food, plant nutrients as a benefit of consumption. Slightly less exciting. So after a raw plant is harvested, it is put through a drying and curing process which partially causes the decarboxylation to occur due to the long curing. Time being the first of two methods of decarboxylation. This means that raw THCA loses its acid group and now measures in small amounts as active THC in the drying flower. Because, spoiler alert, THC isn’t actually present in a raw flower until it is decarboxylated into its psychoactive better half. The reason you can smoke or vape raw matter and catch a buzz, can be attributed to the fact that the second method of decarboxylation is heat. Heating raw cannabinoids creates an instant chemical reaction, causing the compounds to change, creating activated cannabinoids. Through decarboxylation, the cannabinoids are free to bind to endocannabinoid receptors found throughout the body and brain, producing therapeutic and cerebral effects. SO, this is great and super simple if you are smoking or vaping, but if you are thinking about dabbling in edibles or topicals, your cannabis needs to first be decarboxylated, which won’t happen naturally in your digestive system. Sorry to disappoint. 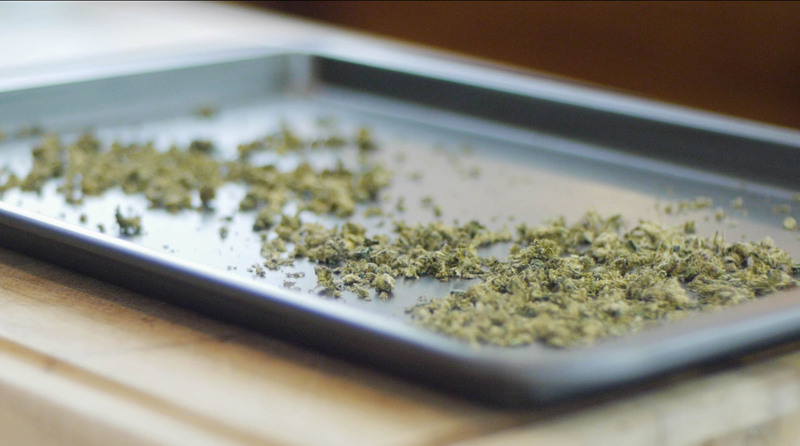 Decarboxylating cannabis at home is a short and simple process that you can find directions for almost anywhere. Because edibles and topicals are not yet regulated in Canada, and won’t be a part of initial recreational legalization, making edibles at home is a solid move towards those good vibes. Your newly decarboxylated cannabis is good to go and full of all those lovely little THC compounds that you’ve been waiting for! Topicals and edibles are a really safe, effective way to get the health benefits of cannabis while having an interesting little afternoon project! So, now that you’re in the know, get out those chocolate chips and get going. Amber is a Registered Holistic Nutritionist who has developed her love for nutrition and alternative medicine into a Cannabis for Wellness Advocacy. She has a passion for educating readers about cannabis use, culture and medicinal benefits.